Do you have an old Facebook account that you’re no longer using with posts or pictures from your younger days that you don’t want people to see? It’s easy to delete your account if you still have access to it. But what if you can’t remember the login information? Here are the two steps you can take to try and recover account access so you can delete your account – and the associated unwanted former memories – permanently. Go to https://www.facebook.com/login/identify to search for your account. You can search by the email or phone number you used to set up the account, or just by name (the search screen doesn’t mention that option but it works, too). If you go the name route, your account may or may not show up, depending on your privacy settings. If you don’t see it, click “I’m not on this list” and you’ll be prompted to enter the name of a friend and search again. Once you find your old account, you’ll be able to send a reset code to any of the email addresses or phone numbers you associated with your account. If you’re not sure which email address you used, Facebook will show you a redacted version (e.g., j*******h@hotmail.com) that should spark your memory in case it’s an old email that you don’t log into anymore. If you can’t access the email address or phone number on your account, your only other hope is Facebook’s Trusted Friends feature. Launched in 2013, Trusted Friends lets you regain access to your account in case of forgotten credentials by asking three “trusted friends” to supply a reset code. The big problem with Trusted Friends is that you had to have set it up in advance for your account, which very few people have done, according to a quick check I did of my friends and other random accounts. If you fall into the category of one of the lucky few who set this up, when you tell Facebook that you “No longer have access to these?” on the email and phone recovery page you’ll be provided with an option to enter a new email or phone number and continue with the process. Click “Reveal My Trusted Contacts” and type the full name of one of your trusted contacts. Facebook will then give you a special URL that each of your three friends need to access. The URL contains a recovery code to reset your account, which your friends need to provide back to you. You will need to contact your friends and provide them the URL – Facebook will not do this for you. If you can’t contact one of your trusted friends for whatever reason, you’re out of luck. As I mentioned above, if you didn’t already set up Trusted Contacts, it’s too late now. When you tell Facebook you can’t access the email account, you won’t have the option to provide a new email address or phone number, you’ll just be told to try logging in again (in other words, you’re outta luck). 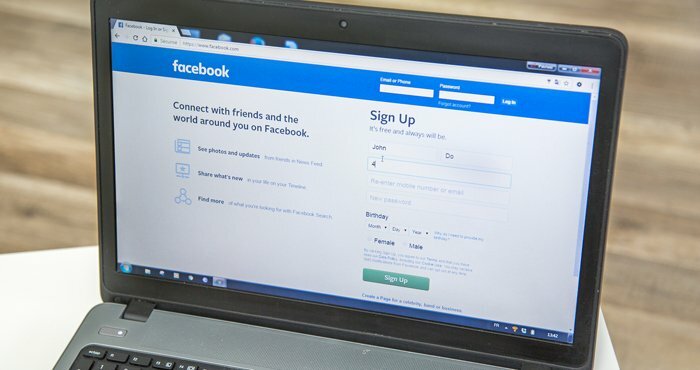 While Facebook makes deleting an old account difficult, thanks to the proliferation of Facebook account spoofing, deleting a fake account is far easier. So one of our clever readers told us in the comments he reported his old account as fake and it was quickly deleted. Another reader also had success going this route. Click the three little dots on the bottom right of the cover photo and select "Give feedback or report this profile"
Click on "Pretending to Be Someone" and then click "Me"
Let us know in the comments if this method works for you, too. I reached out to Facebook and they have confirmed that, for security reasons, they will only allow you to delete your account if you can access it through one of the two official methods above (or our "unofficial" workaround). Those photos of your ex-relationships, nights of drunken bacchanalia and really, really bad choices of hairstyle are going to live on forever in the Facebook universe. However, you may be able to pursue avenues outside Facebook’s standard deletion policies. For example, if you reside in the EU, the GDPR provides the right for consumers to demand companies delete their personal information on request. And if Facebook isn’t responding to a request, you may be able to take the issue up with your country’s privacy officer. Since these aren't officially sanctioned means of getting your account deleted, we don't know what your likelihood of success will be. If you go this route, let us know how you fare in the comments below. My account been taken and the person has controlled it for over two years. Everytime I try to regain it or get a new facebook account he reports it as a fake account. I Can prove who I am Why cant you just help me. In 2016 I’ve opened a face book acc don’t recall my password and now there is something like 4 profile I wantcto get rid of it and I cannot delete it . I want all that discard please if you can help !! I have 2 old Facebook accounts but can not remember any of the old email or passwords. Please help. Would be interested to hear if it works for others. Might be a suggestion we should add to the article if it does. Did you try the options above? Did you follow steps 1 and 2 above to try and reset your Facebook password so the accounts can be deleted? I have deleted the google account associated with the facebook account. How can i recover/remove the disabled facebook account and start over? Have you tried to recover the Google account? i can’t access the old Facebook acct because it is disabled.. i need to free up the associated email address with the disabled Facebook acct. The link above is a means to recover your old Gmail account so you can use it to recover your old Facebook account. I cant get in an old gmail account, actually 2 of them. I have my uaername to both accounts but I have forgot my passwords to both. I have a new phone now and I cant remember the number I had qhen I opened the account. Death of Facebook account holder. How do I close down my late husbands Facebook when I do not know his password etc. ? I tried creating an account for chatting with my gamer friends, and fb disabled the account a few days later before I even had the time to fully deck it out with photos. I don’t have a phone number to add to the account, which was not required at sign up, but when I tried to login today it demanded I give them one in order to access my account. With all the trouble fb gave in setting up the account to now this, I just want to delete it so they can’t spam my inbox. Hate fb. We give you the steps for deleting an account above. Follow those and see if it works for you. If you want your Facebook account deleted, follow the steps in the article above. Posting it here isn’t going to help. HELP PLEASE! This never happened previously. I bought a new mobile phone. As a result I was locked out of my FB account. It’s been a few years since I opened the account. I cannot remember the password. The email used was an old hotmail, more than 2yrs since used -as a result deleted. The phone number was a landline no longer in use. I have tried search by name but end up going in circles because one page after another leads back to the first question. I need to get that account back because of the information (contacts, groups, etc.) linked to the account which was gather over a longtime search. P.S. snail mail doesn’t work from Canada to USA. Try reactivating yor old Hotmail email? Have you tried setting up a new Hotmail account using your old email address? If not, you’ll likely need to recreate your Facebook account. But it shouldn’t be a big deal to resubscribe to the various groups you’re interested in (you can even look at the old account to see what groups it was originally a member of). Also, it sounds like you were autofilling your password on your old phone. Are you sure you don’t have your passwords synced to Google? If you are using Google as your password manager, you should be able to get to it through https://accounts.google.com/. Will reporting my account keep me from using the same name later on should I want to try it again with facebook? Will they delete both the main account and business page connected to it? Reporting your account shouldn’t prevent you from using the same name later. After all, there are many people with the same name on Facebook. As far as your business page, I’m not 100% sure. However, a page requires at least one owner. And if this is the only account associated with it, then you wouldn’t be able to make any changes or updates to the page in the future. Thanks for the reply. That account might be lost to me forever unfortunately. I can’t even find it in the search cause I might have put the preferences as “only friends can search for me” and never got a chance to change that before being locked out. It was worth a shot. I just wish Facebook had a proper phone number for customer service support. It would fix so many technical issues and loopholes. Did you follow the advice in Step #1 above? If so, what happened? They say the can’t get to my account all because of a fogotten password. What exactly did they say? Did you follow the steps in part 1 above? If so, what exact message did Facebook give you?